Get the timeless look of parchment paper on handy return address labels from Check Advantage! The weathered texture of calfskin is portrayed on this traditional design. It will add class and sophistication to each and every envelope you send in the mail. Parchment Address Labels are self-adhesive, which will save you time when putting together your outgoing mail. These convenient stickers can also be used to label all sorts of personal property with your name and address. 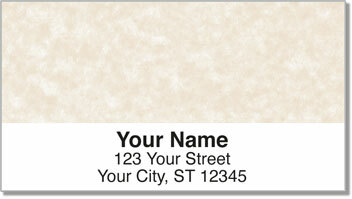 Get your very own Parchment Address Labels right now! You can also order a matching Parchment personal check design.